Now on deposit in the Graphic Arts Collection, thanks to Bruce Willsie, Class of 1986, is a rare engraving: Robert Barker (1739-1806) and Henry Aston Barker (1774-1856), [Key to the panorama ‘London from the roof of the Albion Mills’], ca. 1792. Graphic Arts Collection. In 1791, Barker’s first London show, View of London from the Roof of the Albion Mills, began at the five-story, steam-powered flour mill on the south side of Blackfriars Bridge designed by Samuel Wyatt in 1786 but gutted by fire in March 1791. * After London, the painting toured Europe and many of the brochures or descriptions given to the audiences were printed in several languages. 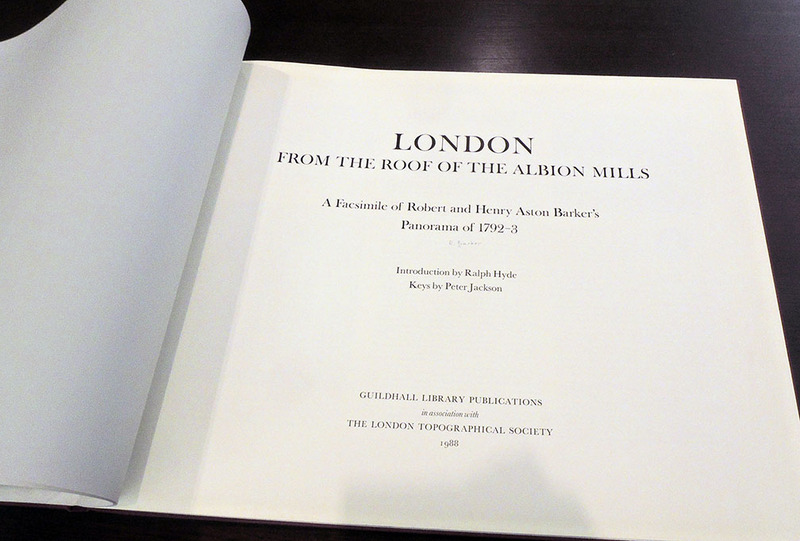 “[Robert] Barker’s Panorama of London from Albion Mill does not survive, although contemporary visual evidence is offered by two descriptive orientation keys and a set of commemorative aquatints. Panorama visitors were given such descriptive keys gratis, not only as souvenirs, but also to inform them of significant sights: they are themselves an important response to Barker’s epistemological anxiety about his painting. The panorama’s scenes weren’t what you might expect. 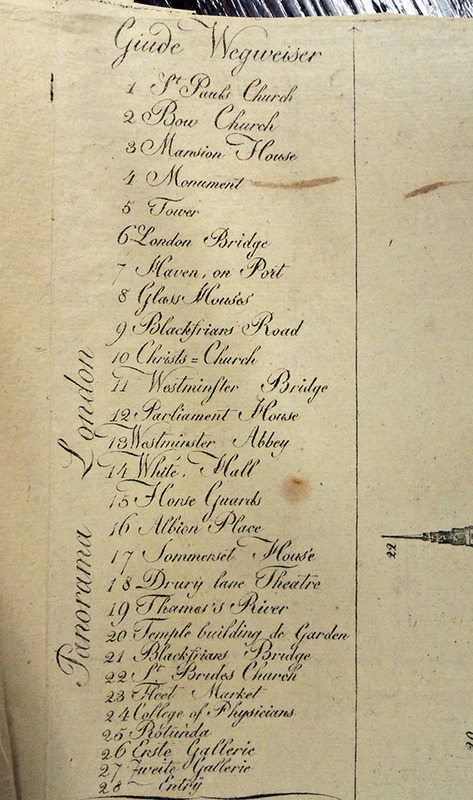 One set of the six memorial aquatints can be found at the British Museum, and a mounted set is held at the Government Art Collection, Queen’s Yard, 179a Tottenham Court Road, London [see below]. 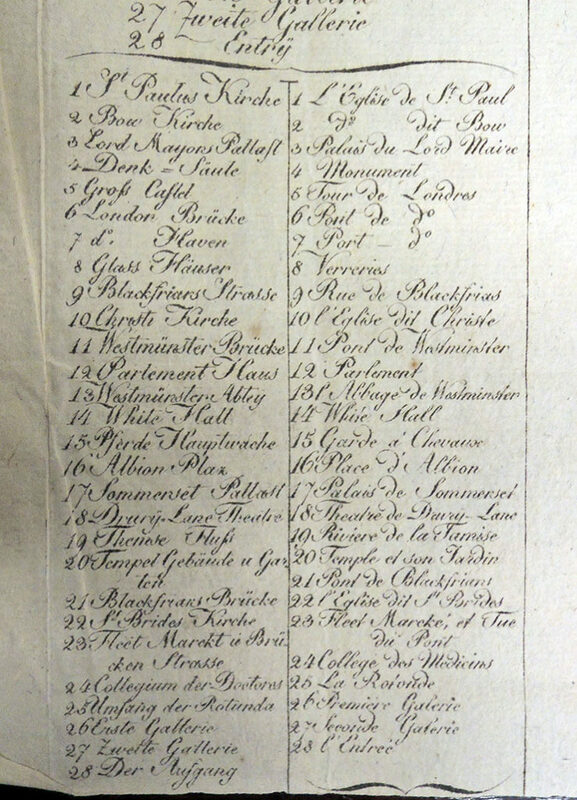 The British Museum has two versions of the key print, describing one as written in French and Dutch, although it appears to be the same as Princeton’s engraving in English, French, and German. 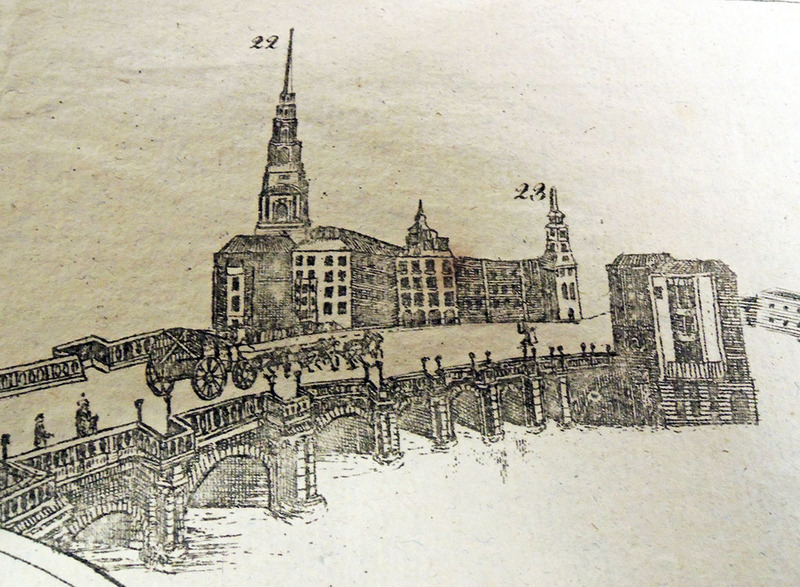 “This 360 degree view is taken from the roof of the Albion sugar mills at the S. end of Blackfriars Bridge, to which vantage point Henry Aston Barker was sent to make sketches by his father, Robert Barker, in the winter of 1790-91 … The son’s drawings were then greatly enlarged and painted in distemper on canvas by Robert Barker to create a 1,479 sq. ft. exhibition panorama. 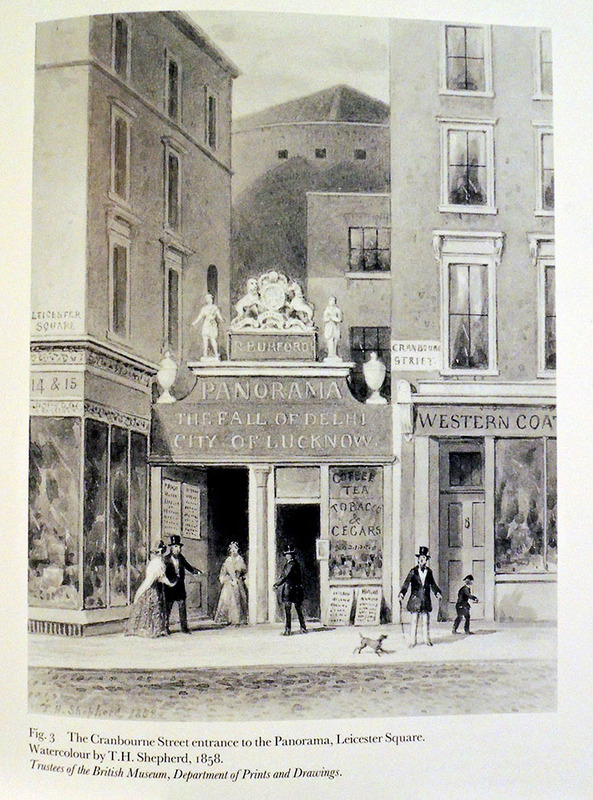 This at first was exhibited at … Leicester Square … Birnie’s aquatints of H.A. 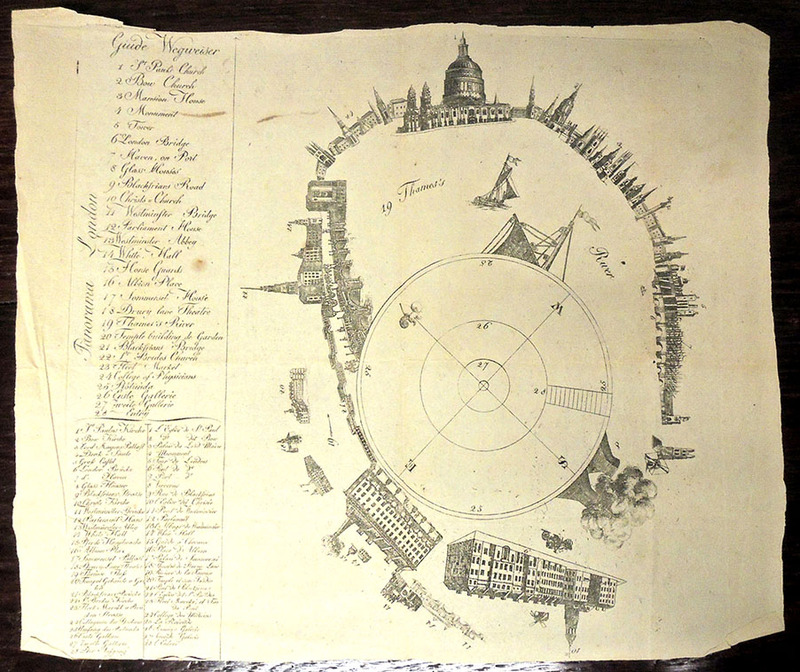 and R. Barker’s London panorama were prepared and published while it was still on exhibition in Castle Street and testify to the show’s popularity. … Altick records that the six aquatints served as the source for America’s first panorama show. Taken to the United States by a gentleman named Laing, they were copied onto canvas by William Winstanley. The resulting panorama was exhibited in Greenwich Street, New York City, in 1795.”–Ralph Hyde, Gilded Scenes and Shining Prospects: Panoramic Views of British Towns 1575–1900. New Haven, Connecticut: Yale Center for British Art, 1985. This entry was posted in Acquisitions, prints and drawings on February 5, 2019 by Julie Mellby.